Click here to download this page for printing. What is a Farm Water Access Plan? 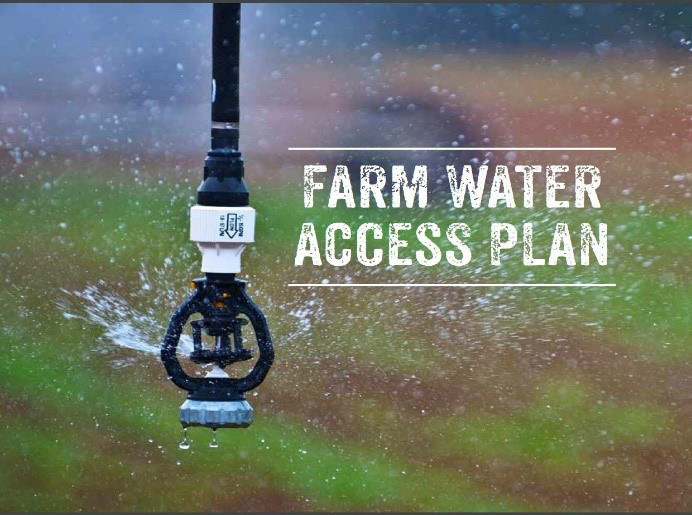 A Farm Water Access Plan (Farm WAP) is a property specific document that guides the sustainable application of Tasmanian Irrigation (TI) water and assists with the long-term viability of land for agricultural production. It identifies where TI water is to be applied and details actions to manage potential risks from applying it. All land (including dams) to which TI water is to be applied within schemes built by TI is to be covered under a Farm WAP. This is a requirement of the Federal Environmental Protection Biodiversity and Conservation Act 1999.
Who needs a Farm WAP? What is included in a Farm WAP? Farm WAPs are prepared for each individual property. The area assessed and incorporated includes all land to which TI water will be applied, both now and in the future, and all irrigation and storage infrastructure TI water will be stored in. They are not a property management plan and do not necessarily have to cover an entire property. What is a Farm WAP linked to? A Farm WAP is specifically designed for a property. They are attached to land and not individual property owners or irrigators. Who is responsible for, and complying with, a Farm WAP? Ordinarily the landowner is the irrigator and therefore the person responsible for obtaining a Farm WAP. In situations where water is transferred or land is leased, a business arrangement between the irrigator and the landowner and/or lessee may be required to facilitate obtaining the Farm WAP. Farm WAPs should be reviewed and checked upon transfer, and prior to each irrigation season, to ensure the Farm WAP area covers the proposed irrigation area and that the land capability is appropriate. Can Farm WAPs be transferred? Yes, Farm WAPs are attached to land. If land is sold or leased, the Farm WAP can be transferred to another property owner or irrigator. To initiate a transfer of a Farm WAP, see TI contact below. What compliance monitoring relates to Farm WAPs? In accordance with conditions of approval of the irrigation schemes under the Tasmanian Water Management Act 1999, TI has implemented a Farm WAP auditing program. The program includes annual audits of randomly selected Farm WAPs, and triggered audits where non-compliance is identified or monitoring results indicating a decline in scheme water quality. Audits focus on compliance with the management prescriptions set out in each Farm WAP. Criteria to be addressed includes whether water has been applied in accordance with the Farm WAP, and whether land capability limitations and biodiversity have been managed, monitoring has been undertaken and required records are being kept in accordance with the Farm WAP. Non-compliance penalties range from offering further information on best practices, through to corrective action notices being issued and in extreme situations water delivery services being withdrawn. Can a Farm WAP be amended to include an additional area? Yes. To apply to include additional area in an existing Farm WAP, see TI contact details below. There may be a cost associated with this. What is involved in preparing a new Farm WAP? There are four main stages in preparing a Farm WAP. Farm WAPs can only be completed by a prequalified consultant who has been approved by the Minister for Primary Industries and Water. They are prepared in accordance with the soil, water and biodiversity modules approved by the Department of Primary Industries, Parks, Water and Environment and generally take between two and four weeks to prepare. There are costs associated with preparing a Farm WAP. To apply for a new Farm WAP, see contacts below. Irrigators proposing on taking water from a scheme under construction will be contacted by TI directly to arrange for a Farm WAP to be developed. Farm WAPs for schemes under construction are prepared in batches which provide cost efficiencies for each irrigator. To amend an existing Farm WAP, prepare a new Farm WAP or for general information, please contact the TI Farm WAP officer, on email or phone 03 6398 8433.